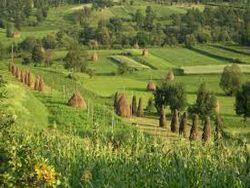 Maramures is Brigadoon land where the way of life has changed little over the centuries. In late afternoon, old women sit outside their gates coaxing coarse wool onto spindles. Many still favor traditional dress, meaning white frounced blouses, striped woven panels covering full black skirts, headscarves and opinci, a sort of leather ballet slipper from which heavy yarn criss-crosses over thick socks. On Sunday, such dress is practically de rigueur, even for little girls. Hardly a village lacks its own small wooden church dating to the 17th and 18th centuries. These are exquisite, high-steepled jewels with multiple gabled roofs, all of a pattern yet each distinctly unique. Seeing at least a few interiors is a must as many frescoes remain in good condition. If time is limited, the interiors at Ieud, Bogdan Voda and Poenile Izei are recommended. The latter depicts some highly original torments for such sins as sleeping in church. While the main tourist activities in Maramures are gate-, church- and people-viewing, the town of Sighetu Marmatiei has a few attractions worth visiting. The outdoor village museum, on the road into town, boasts dozens of homes and farm buildings assembled from around Maramures county. Even Oncesti s wooden church has been relocated here. No trip to Maramures is complete without a look at the Merry Cemetery of Sapanta, a 20-minute drive from Sighet. Here, colorful folk art pictures and witty words carved into wooden headstones immortalize the deceased's foibles, occupations or family problems. No translations, but the pictures tell much of the story. An old woman bakes round loaves of bread, a young person bends in scholarly fashion over his books, one man is shot by soldiers while another tends his flock of sheep.